There is a lot of pent-up demand for Apple’s (NYSE: AAPL) new iPhone 7 that just released. It’s the first new model in over two years (last year’s was just a tweaked version of the old one). We can gauge the level of the pent-up demand by looking at the collapse of iPhone sales in the first half of this year. Apple sold 109 million (M) units in the first half of last year. But just 92 million units so far this year. That’s over 20 million upgrades waiting for the iPhone 7. That’s a lot of buyers and analysts are forecasting 80M unit sales, a jump from last year’s 74M. It will likely help Apple beat its results for last year’s fourth-quarter (holiday season). At the same time, Apple’s competitors are gearing up to retain their own market share. Samsung, for example, released their new flagship phone two weeks before Apple. This will cause a huge wave of electronics to hit the stores this month. And through the end of the year. All of which means a big impact on electronics suppliers – mainly from Asia. This is a wave that will surge and crash, and its surge will distort global macro data signals. The timing of the wave matters: for electronics suppliers, the wave started in June. You need to work backward from early September when iPhones had to be on store shelves. That means the phones were shipped in August and built in July. To meet the sudden surge in demand, semiconductor suppliers started production in June. That need to ramp-up semiconductor supplies is reflected in the upturn in silicon wafer shipments in Q2 (silicon is the precursor to semiconductors). We can also look at Taiwan’s TSMC – the world’s largest semiconductor contract manufacturer and the producer of the guts of smartphones. 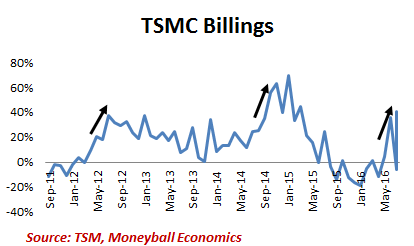 Notice that every time a new iPhone is released (2012, 2014, 2016), TSMC business begins to surge in 3Q. To understand how big of an impact the iPhone has on Asian manufacturing… just look at Taiwan and Korea. Almost 45% of Taiwan’s industrial production comes from electronics. The jump in semiconductors that we saw in TSMC’s billings in the chart above is seen immediately in the jump in Taiwan’s electronic components industrial production. 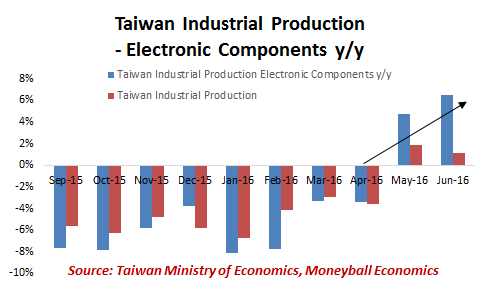 And then into Taiwan’s overall industrial production numbers. Meanwhile, South Korea’s IT exports reflect the production of iPhones. 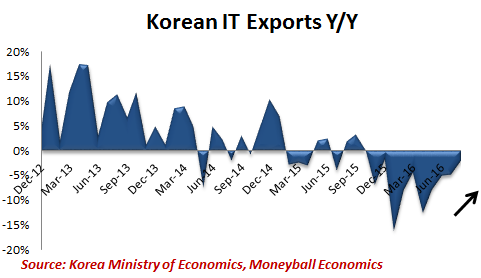 Korean IT exports dropped 5% in June year-over-year (yr/yr.) The 5% drop was a contraction… but a significant improvement from the double-digit contraction seen over the past few months. The important point is that the iPhone-triggered macro surge is a regularly repeating event. Each time a flagship phone gets released, Asian macro signals jump. 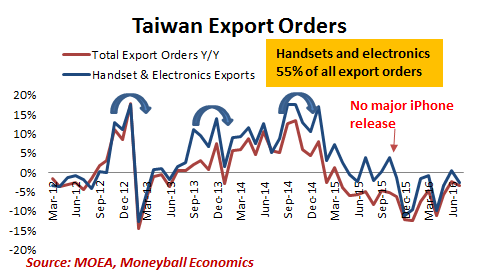 You can see Taiwan’s exports order surge each time a new iPhone was released. And then they recede. This time will be no different. Asian central banks are delaying easing thanks to Apple’s iPhones. You see, the narrative today is that the global economy is stabilizing, and the Asian macro signals will suggest improving conditions. We know that it’s a distortion from the new smartphones, but others don’t. Meanwhile, the positive effects for the Asian macro view will last until December. Although smartphone production winds down by November, there’s a lag in data reporting. However, the reality is that global trade is stagnant. 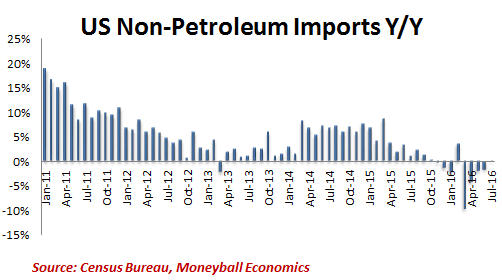 Just look at US imports (non-petroleum). US imports provide a good signal because Americans are major consumers. When imports are down, it’s a sign of trouble. Today, imports have contracted or grown less than 2% y/y nearly every month for an entire year. This makes many Asian countries extremely vulnerable… because most of them depend on exports as their primary source of income. Vietnam, Malaysia, and the Philippines are the most vulnerable when electronic exports sag. They will be the first to ease. South Korea and Taiwan are the next in line to ease. KEY POINT: Asian countries are seeing a surge in export data thanks to Apple’s new iPhone release. But the relief will be short-lived. And come December, export data will turn down again… forcing most Asian countries that are dependent on semiconductor and manufacturing sectors to devalue their currencies as an effort to keep market share.